I did this interview for the Peoria Journal Star's THINK THEATER blog, where I post about once a week on behalf of Heartland Theatre Company. I enjoyed the piece so much that I thought I would run it here, too, on my own blog, as a lead-up to "A Tuna Christmas," opening on Thursday. Dave Krostal is half of the cast of Heartland Theatre’s upcoming production of "A Tuna Christmas," opening December 9th, and running through the 19th. This is Krostal’s second take on "Tuna Christmas"; he and co-star Don Shandow did the play before and are bringing it back to Heartland as a special benefit show. (That's Dave up there on the right, with Don Shandow on the left, in the previous production they did together.) 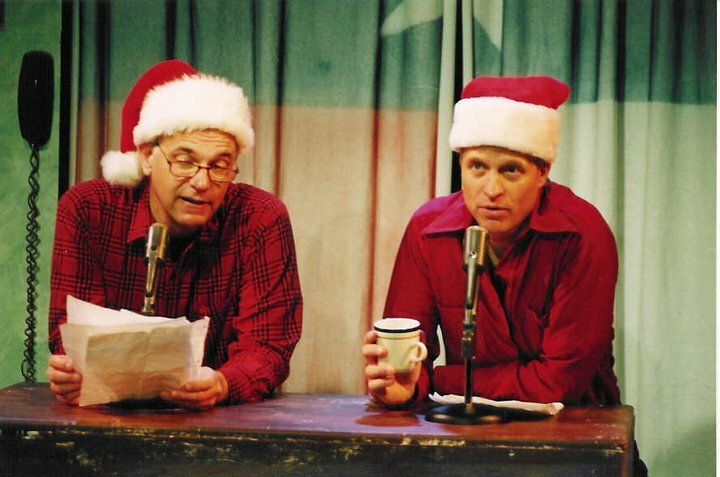 I had a chance to ask Dave some questions about himself, his playwriting career and, of course, "A Tuna Christmas." Tell us a little about your interaction with Heartland Theatre. Tuna is my 25th show at Heartland starting with "Death of a Salesman" in 1991 (directed by Don Shandrow incidentally) and my 63rd play total. I have directed 3 times at Heartland. "Elephant Man," "Compleat Works of William Shakespeare Abridged" (with Dave Flanders) and two of the three acts of "Stages" by John Kirk. You’ve also written for Heartland. I know about "If Only," the winning 10-minute play. I have only submitted one play to the playwriting contest but plan on doing another one to submit for this summer’s 10-Minute plays. I have only been writing plays for about 3 years. A group of us get together about four times a year and submit and act out the plays we write. The group is called Write Club and it is a group of actors, writers and just fun people who enjoy the the writing and acting process. Where did you get the idea for "If Only"? It was getting close to the holidays and I was spending time with family. Wondered what it would be like not to know who my dad was. That was the impetus. I then just rolled ideas around in my head to see how that might fit into the theme. It was my first submission. I have an idea for this year’s theme. They always sound much better in my head then they do when I write them. It is a real process. I always feel like they are never done. That I can always improve the dialogue. It is both exhilarating (when it all comes easy) and frustrating (when I stare at the computer waiting for something to happen). What it was like to see your work realized on stage? It is VERY exciting to see your work come alive on stage. I just remember being engrossed with watching the show. It is really like nothing else I have experienced on or off stage. It was like teaching my daughters how to ride their bikes and seeing them finally get it. What do you think is the value to a playwright of entering this kind of competition? The great thing about the 10-Minute Play Contest is that allows one to get feedback on their work. To see how it plays differently than how I may have imagined it while writing it. I had two wonderful actors (Todd Wineburner and Gregory Hicks) and an insightful director (Holly Rocke) producing the play. I could not have been more pleased with how it was done. Okay, now about you! Is your academic background in theater? You teach at Washington High School, is that right? What do you teach? I taught English for about 14 years. I have been teaching Psychology (I have a Masters in Counseling from ISU) for the past 9 years. I taught Theater and English in Texas for 4 years in a town similar to Tuna. I also did an exchange in Calgary Canada for a year where I taught theater. How does that inform your acting or play writing? You will be appearing very soon in "A Tuna Christmas" at Heartland Theatre. You’ve done this play before, right? Was Don Shandrow the other half of the cast then, too? What do you like about the Tuna world and the whole parade of characters you play? Honestly, we have a LOT of fun rehearsing the show. So much of it is “over the top” and I could not ask to work with a better co-star. Don is a BLAST to work with. The show really allows you to kick back, have some fun, be goofy, and, hopefully make a whole lot of people laugh. It is one of the more technically challenging shows I have done. 11 characters, 25 costume changes. I leave mentally and physically wiped out every night. It’s a great work out! Do you have a favorite Tuna personage? Ummmm….not really. All the characters have their own little gems. Does it feel the same to play these characters opposite Don again? As Mike Dobbins (Heartland Theatre Company Managing Artistic Director) always says, "If you enjoy the show half as much as we enjoyed bringing it to you, tell two friends." Enjoy!!!!! "A Tuna Christmas" opens this week. Remember, it’s a special benefit and not part of Heartland’s regular season, so flex passes will not be accepted. All tickets are $12, although that flex pass will get you $2 off the regular price if you have one. For reservations or more information, visit the Heartland website here.